The Indesit IT50EW Freestanding Twin Cavity Electric Cooker has been rated B for its energy efficiency and consumes 0.99kwh upon usage. This model also features an interior light, which allows you to monitor the cooking progress without opening the oven door keeping the temperature inside stable. Compact and discreet, this model is modern in design and does not take up a great amount of room in your kitchen. The hob comes with 4 cooking zones, which include 1 large, 2 medium and 1 small also known as Simmer. 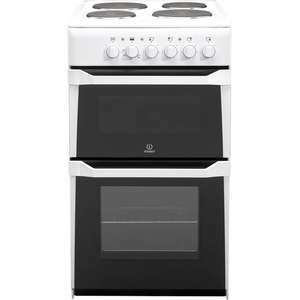 The Indesit IT50EW Freestanding Twin Cavity Electric Cooker comes with an impressive 58 litre capacity in the main cavity and an additional 28 litres in the second. me are u in London? these old style cookers are pretty rubbish the hot plates up top take ages to heat up and cool down. This states it uses 0.99kwh which means its pretty puny ...less efficient than a more modern induction cooker. COOP Electrical doesn't exist anymore. these old style cookers are pretty rubbish the hot plates up top take ages …these old style cookers are pretty rubbish the hot plates up top take ages to heat up and cool down.This states it uses 0.99kwh which means its pretty puny ...less efficient than a more modern induction cooker. But more in some people’s price league, a microwave and cheap microwave meals isn’t the way for anyone to live. They have to pay the sparky and 200% profit. I agree with you.